Fine in new dust jacket. Sewn binding. Cloth over boards. 736 p. Contains: Illustrations. Audience: General/trade. States 2nd edition on the title page also number line is 98765432 on the copyright page. This is the 2 colour edition. too much style, too little substance. the story of the house lured me in and propelled me through to the conclusion but most of the book was filler. the excessive footnotes were distracting and annoying and added little or nothing at all to the story. as i was having to turn the book upside down and sideways and very nearly bending over backwards to read some pages, i pictured danielewski grinning with delight at the headache and neck strain he'd caused me on account of his being so gosh darn clever! all of this over-complication and assault of useless words made me grow more and more detached from the plot and the characters until i just wanted the book to end. my irritation level elevated to the point that i was even annoyed by the pages with almost NO WORDS. "waste of trees" comes to mind. i appreciate the effort that it took to do something different but not the effort that it required to drudge through most of it. i would recommend reading "tom's story" and "the three attic whalestoe institute letters" and then picking up a new book. This is one of the few books that I consistently recommend to people. It frightened me more than anything Stephen King's ever put out, as well as sparking some fascinating discussion between my friends and me about madness, reality and perception. Basically, it's a book about a documentary that was never made, about a house that doesn't exist. This book plays with your mind, plays with language, and plays with conventions to create an extremely unconventional - and strangely compelling - novel. Highly recommended. I was given this book as a gift (on a third date none-the-less), and have since given it to many people. That relationship didn't last ( I don't recommend giving a horror novel to someone as a first present), but it is a great present, especially for men that may be hard to find books for. Like nothing I have ever read, or seen again, I thought this book was like a literary horror. Not too gross to be read before bed, but enough to make you double check the lock. A young man with not much direction, and too many women, in his life finds a trunk left by a strange old man. As he unravels the contents of the box, he gets sucked into the story it contains, and begins to loose his mind. Filled with footnotes, strange text, and directions that send you searching throughout the book for the next link in the story lines, it is as entertaining to read as any book I've come across. 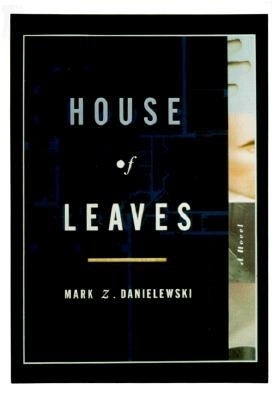 House of Leaves will haunt you long after you have finished it. The author blends 3 stories together in a way that draws you into the book. By the end of the novel it feels more like an experience then a novel. House of leaves proves that Danielewski is very talented.